No Toilet Paper. No Impact Man. Here’s a link to an article about No Impact Man who quit using toilet paper for a year. While we have given up paper towels and paper napkins, we still use toilet paper. I try to be a conservative user, but the husband likes a handful of the stuff. We use Scott, which I need to explore as to its environmental friendliness. I have used the recycled stuff and may go back to using it. Folks used to chuckle when I told them that I was using recycled toilet paper. I mean, it’s toilet paper made from recycled paper. Not toilet paper previously used. Is it? When I was a younger woman, a fellow environmentalist told me of reusable feminine products. I balked at that idea, too. No way would I wash those things out. Nature has taken its course of my usage of those products. So, I’m down to the toilet paper. Last year, I was challenged by a reader of this blog, when I was bragging about the amount of stuff my husband and I took to the recycling center. I mentioned that newspapers, a daily Tennessean and a daily Wall Street Journal, were the majority of our recyclable load. She chided me as to why I bought daily newspapers in the first place, when the content could be read on line. I admitted that I liked to sit in my easy chair each morning, drink coffee, scan the news, then do the crossword puzzle. She replied that I should buy a book of crossword puzzles. In 2008 as one of my New Year Resolutions, I stopped the daily delivery of the newspapers to the house. At first, I could not sit at the computer, read the paper online and drink the caffeine stimulant to jumpstart the day. I preferred to sit in my easy chair with my feet propped up, drink coffee and read a book. I would gather daily headlines off the internet later between tasks at work. Many days, I received no news, but fortunately, I realized that I really did not need to read the live newspaper each day. I bought a book of crossword puzzles to stimulate my mind. I have saved money and saved a few trees this year. Next I announced to the husband that we were not buying paper towels any more. These were not being recycled, but going into the landfill with our trash. I bought a package of 60 cotton household towels from my favorite megastore. We have used less than half the bag of towels for the first time, as we launder them with the bathroom towels weekly. Now, we’ve saved money and reduced what we send to the landfill each year. Did we stop there? No way. I announced next that we did not need paper napkins. Again, this is a paper product being used and tossed into a landfill. We have a set of polyester (linen-looking) napkins that we use for guests. And if we have not had a chance to launder our napkins, I’ve presented our guests with a clean cotton household towel to use. Since my friends know that I’ve become environmentally-crazy, these have been accepted with a chuckle. Both my husband and I suffer from allergies. I stopped buying Kleenex tissues long ago. I have tried to carry a bandana handkerchief around with me, but it never seems to be present when I need it (just like those reusable grocery bags in the closet). Instead, I use toilet paper to clear my sinuses. Toilet paper is the one paper product I refuse to live without. Recyclable or not. When you make your New Year’s Resolutions soon, try reducing the amount of stuff you recycle or throw into the garbage can. Fast food is disgusting. I never eat it any more and never will again. It tastes and smells bad. Plus fast food vendors create so much trash, which is tossed into the environment. Fast food has individually packaged catsup packets. Or it it individual barbeque or honey mustard sauces. Fast food has paper napkins, paper bags and wrappers. 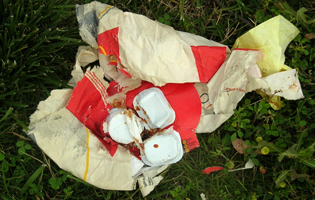 How many trees are sacrificed for fast food wrappings? Do natural scavengers like possums and raccoons eat fast food? Probably, they eat garbage.